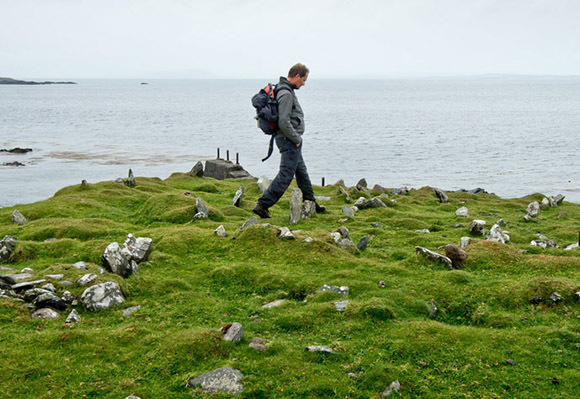 Notre Dame anthropologist Ian Kuijt walks along Inishark. The last Irish residents of Inishark left their coastal island homes in 1960, leaving behind an island eight miles into the Atlantic Ocean that never had electricity, phones, or cars. It’s coming to life again, though, thanks to new technology—a multimedia book project by Notre Dame anthropologist Ian Kuijt, filmmaker William Donaruma ’89, alumni Ryan Lash ’10 and Katie Shakour ’09, and Tommy Burke, a local Irish historian-archaeologist. 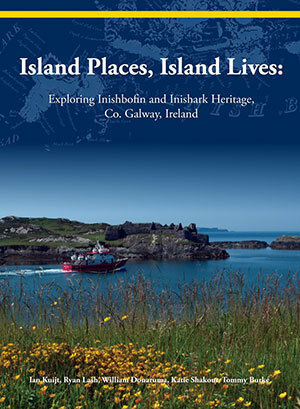 Through an innovative collaboration, Kuijt, a professor in the Department of Anthropology, and Donaruma, a teaching professor in the Department of Film, Television, and Theatre, have developed Island Places, Island Lives, a multimedia book detailing the heritage and history of Inishark and its neighboring island, Inishbofin. Along with text and photographs, the book incorporates short videos of the island developed by Kuijt and Donaruma that can be viewed on a smartphone or tablet when readers, using a free companion app, hold their device over individual pictures in the book. The 22 videos, ranging in length from two to eight minutes, combine high-quality cinematography, narration, and traditional Irish music. Each explores aspects of island life over generations of inhabitants, from the medieval era to the 20th century. 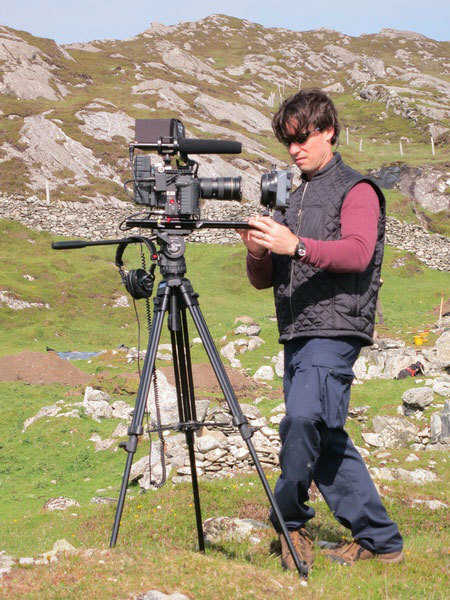 William Donaruma filming on the island of Inishark. Kuijt has spent nearly a decade researching the history of the islands and leading an archaeological excavation as part of the University of Notre Dame Cultural Landscapes of the Irish Coast research project. Because Inishark changed little over its last 100 years of habitation, he said, it offers valuable insights into post-18th-century life in Ireland. Kuijt and his team—including researchers from University College Dublin and Trinity College Dublin, as well as Notre Dame undergraduate and graduate students—have also interviewed several of the last 10 surviving residents of Inishark, whom they brought back to visit the island and tell their stories. In 2012, Donaruma joined Kuijt in Ireland to film the archaeological excavation, and the multimedia project evolved from there. Kuijt and Donaruma launched the innovative book and presented some of the videos during an Irish Heritage Day event hosted by the residents of Inishbofin in September 2015 and are planning additional events in Dublin, Clifton, and Galway, Ireland, in the early spring. They also plan to continue collaborating on the project—with a documentary film currently in the works—and look forward to returning to the islands soon. Originally published by Carrie Gates at al.nd.edu on February 02, 2016.